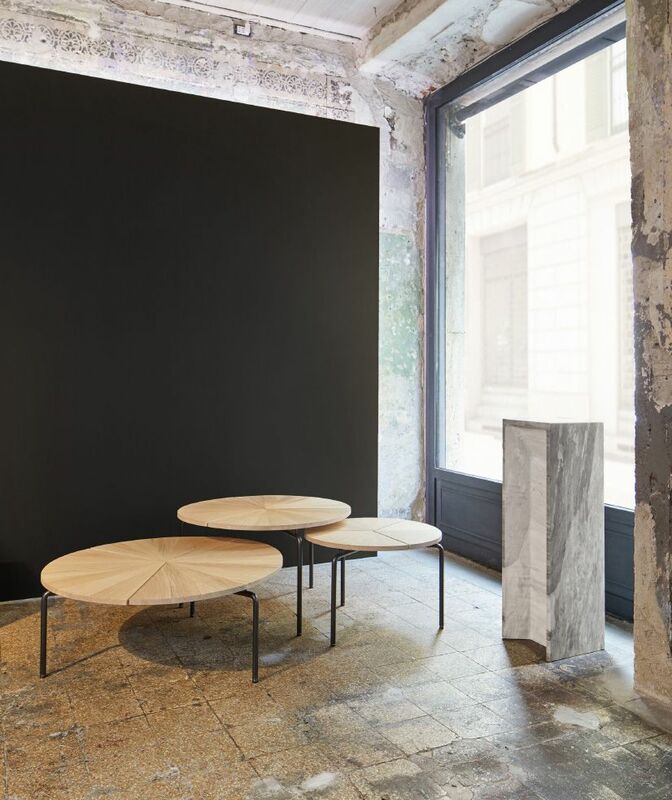 For our latest collection of work, which debuted at Salone del Mobile this month, we have taken inspiration from the prosaic, elemental nature of some of our favourite materials. The resulting pieces are an expression of how sometimes the simplest yet most thoughtful manipulation of stone, wood, metal and leather can create something erudite and powerful. These pieces are about purity of shape and form, with nothing superfluous added. Subtlety is everything. For our Milan presentation we have created a tranquil exhibition space within raw concrete gallery walls. Using raw-effect oak wood screens and panels painted in a deep, dark Parisian Blue first formulated in the 18th century in Berlin, several distinct zones have been created, separating our new brass pieces from carpentry and also textiles. The debut of these pieces at Milan this year is apposite. For some time we have been fascinated by the history of stonemasonry in Italy, specifically in the region around Val Camonica, one of the largest valleys in the central Alps. 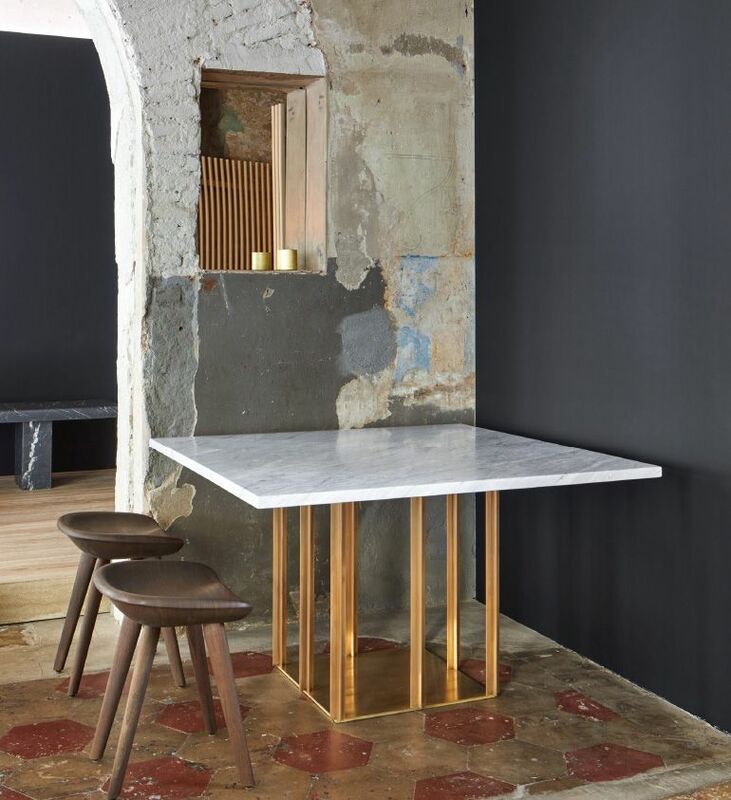 For over 100 years this has been home to Moncini, the stonemasons that we collaborated with on a range of new benches and tables, rooted in traditions that go back generations, but executed in a totally contemporary way. The valley where Moncini are based is also the area with the largest collection of petroglyphs on the planet. The simplicity of line of these prehistoric markings on stone intrigued us – they decorate the material’s surface with such a light, but also permanent, touch. in evidence in Neolithic monuments. But as a way to mark and to designate, it goes back further. It is elementary, strong and visually pleasing. When transformed into something three-dimensional, it can be uniquely elegant, retaining a lean mass, but offering something more expansive than just a simple line. Grouped together, it hints at something scientific and analytical, graph and grid-like. The unrealised plans for Corbusier’s cruciform towers in Paris are radical and thrilling – when viewed from the sky they would have been truly magnificent. When presented as a group, three dimensional cruciforms are both rudimentary and analogue, but also erudite, like the most striking minimalist sculpture. The cross is the simplest sign, but also perhaps the ultimate – a motif stripped down to all that is essential. As always, “craftsman modern” was our overriding philosophy for all of this new work. Most of these pieces appear simple, but they are the result of painstaking study and evaluation. Every effort was made to preserve the inherent beauty of the materials we used. In some cases, the shapes look more ancient than timeless, as if they may have been excavated from Val Camonica. At the same time, they are wholly contemporary. of a table – in engineering terms, it is almost impossible to better the dynamic. These designs are about stripping things back to basics, paring down things visually to what is fundamental. 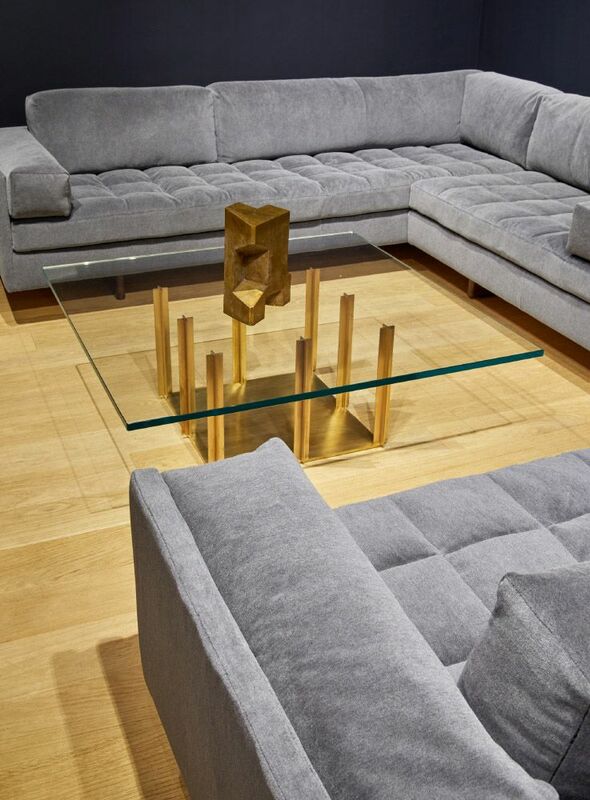 The new series includes occasional tables and dining tables, with surfaces in wood, glass, stone and leather. The desk that makes its debut at Salone del Mobile features a graphic leather wrapped top, with pieces of hide segmented into the quadrants of a cross, with a flush leather welting detail, and an underside that has been finished in linen. This new collection of tables and benches, produced in association with Moncini in Italy, is a paradigm of “elemental”. 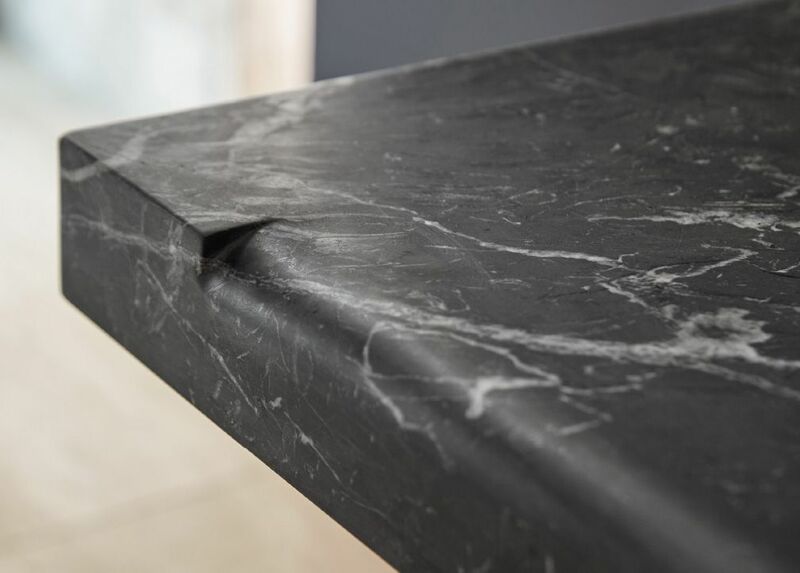 Each piece is created using the same concept – single pieces of travertine, Nero Marquina or Bardiglio Grey marble are carved and shaped to create an elegant modular element – the interior carved aspects sandblasted for a rough textural effect, with the outer section honed and smooth. A single element is used for occasional tables and plinths, a half element is used as a single leg for benches and table. The conceptual basis behind these works is particularly satisfying – the fashioning of shapes from single solid blocks of marble. It is an ancient methodology that suits these dynamic and fresh shapes. This is a collection fit for both institutional environments and private homes. Several new materials make their first appearance within our collection for 2019. We are presenting our classic Daybed and Tractor Stool in Black Oiled Walnut, as well as several newer designs – our Wedge Side Chair and Wood Frame Side Chair. Our Circular Series Tables and Geometric Side Chair will be shown in Raw Effect Oat. As well as these two new woods, we also present a new metal finish – a richly coloured oxidised gunmetal. We continue to work with Geiger Textiles, and this year we add to our library of fabrics with the introduction of Allusion, a striking, super-plush velvet woven from a mix of alpaca, wool and nylon. The textural and tactile effect is dramatic – to the touch it is as sensuous as shearling. We will be showcasing Allusion on a single large U-shaped asymmetric sofa. We introduced a new material on our classic pieces – Black Oiled Walnut. 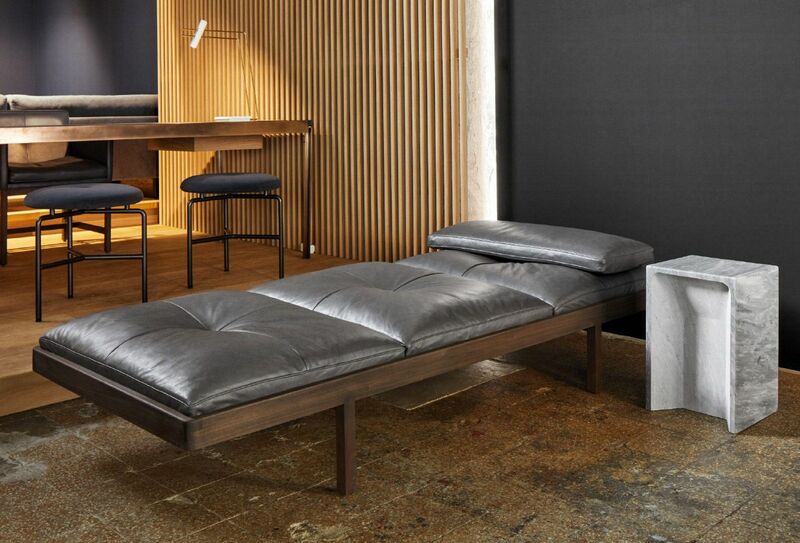 Shown here on the CB-41 Daybed. New Plaza Collection CB-742 Plaza Side Table in Bardiglio Grey marble. Another new material is Raw Effect Oak and gunmetal. Shown here on the Circular Coffee Table series. 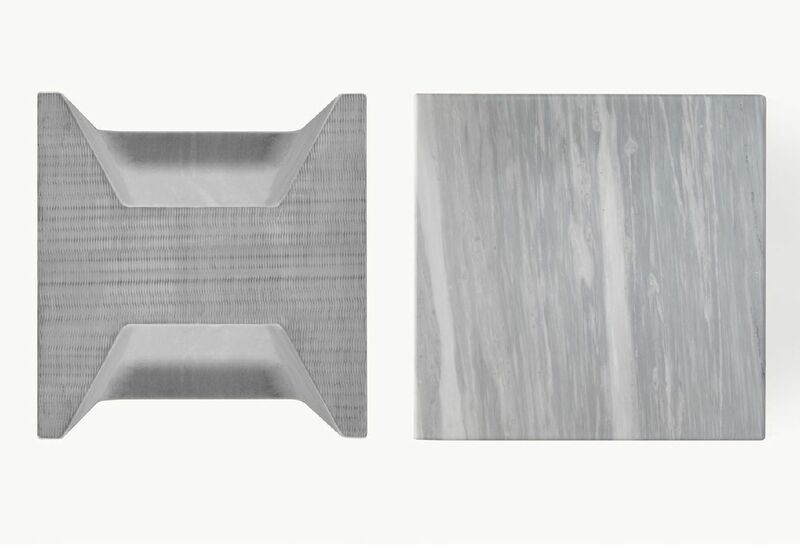 Also, new Plaza Collection CB-743 Plaza Plinth in Bardiglio Grey marble. The Plaza Collection features a carved, solid marble modular element. Shown here from below and above. The modular element is used as a leg of a bench or as pedestals of a table. 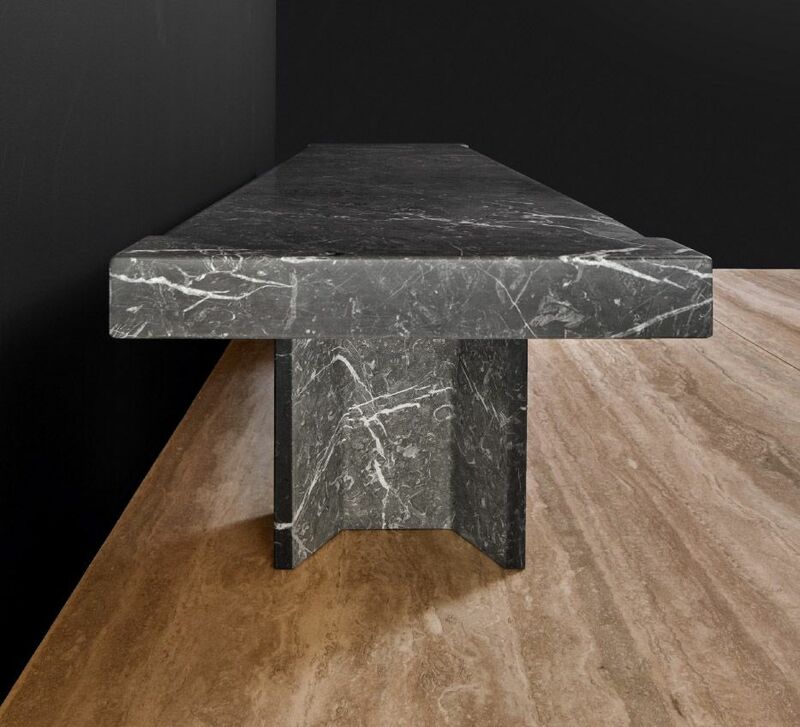 CB-748 Plaza Bench in Nero Marquina marble. The Plaza Bench is carved for sitting. 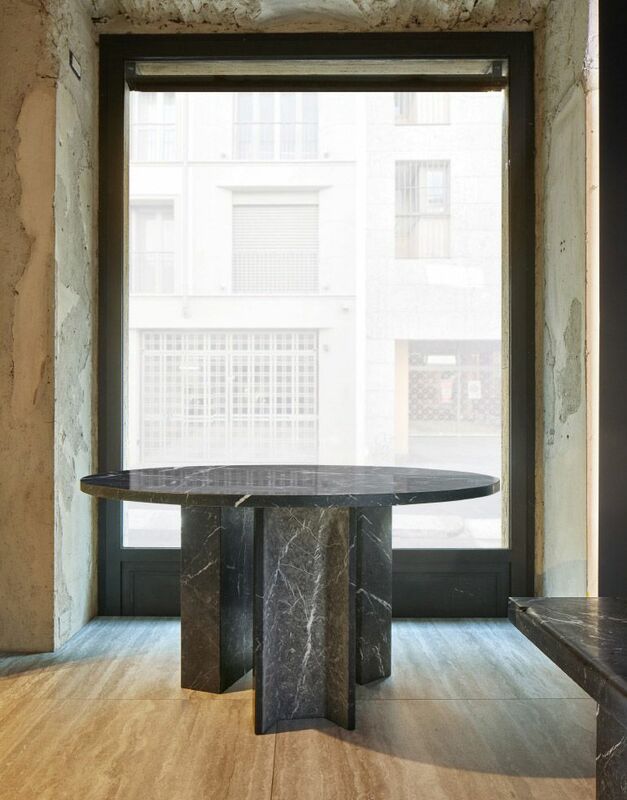 CB-747 Plaza Triple Pedestal Table in Nero Marquina marble, showing three base elements. 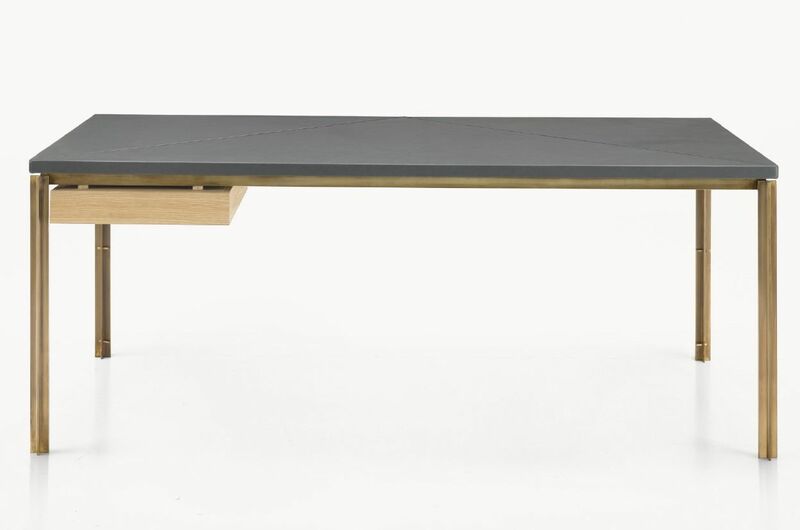 The new Cross Table Series features extruded cruciform sections of solid brass and glass, wood, stone, or leather tops. CB-161 Cross Coffee Table. The CB-167 Cross Leather Desk includes simple wire management. 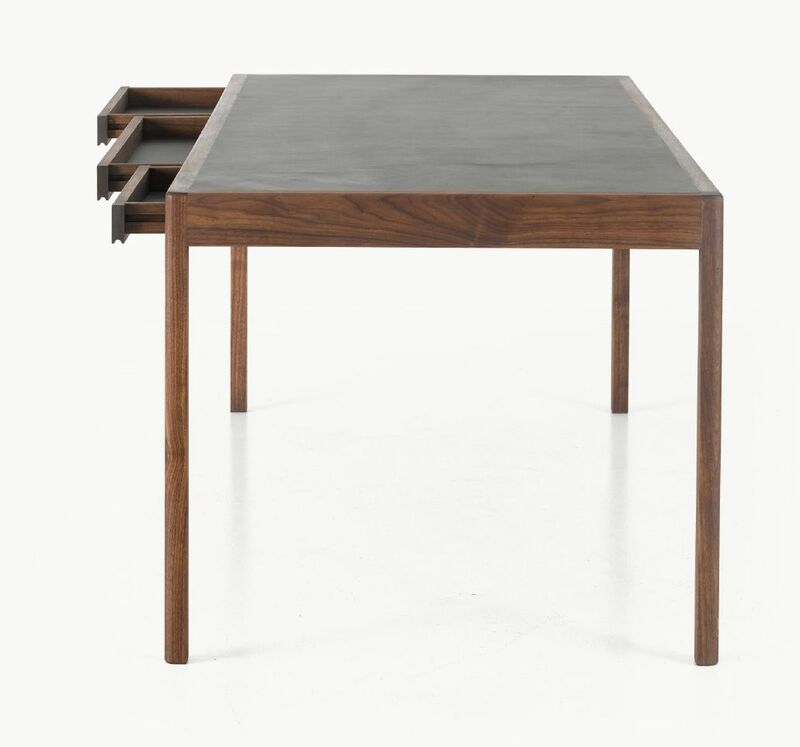 The CB-167 Cross Leather Desk includes a pencil drawer on either the left or right. 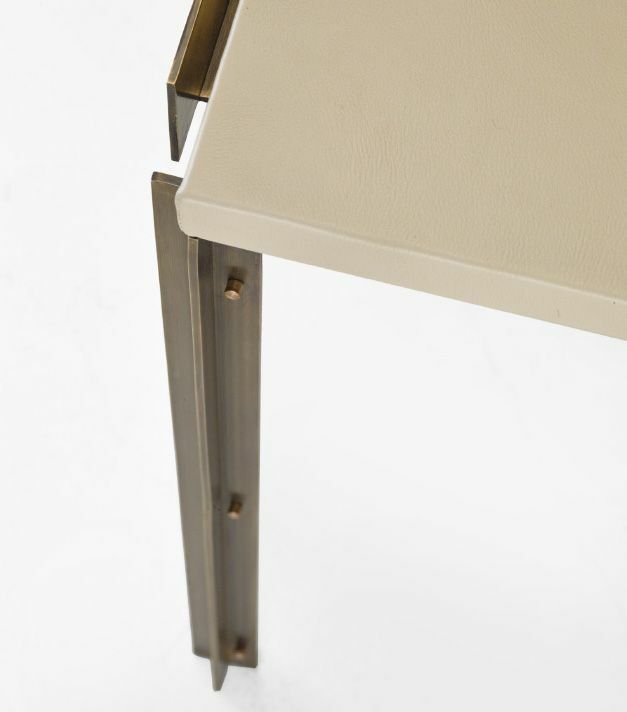 The desk features a graphic leather wrapped top, with pieces of hide segmented with a flush leather welting detail. A BassamFellows classsic CB-311 Leather Desk in new Black Oiled Walnut and leather. 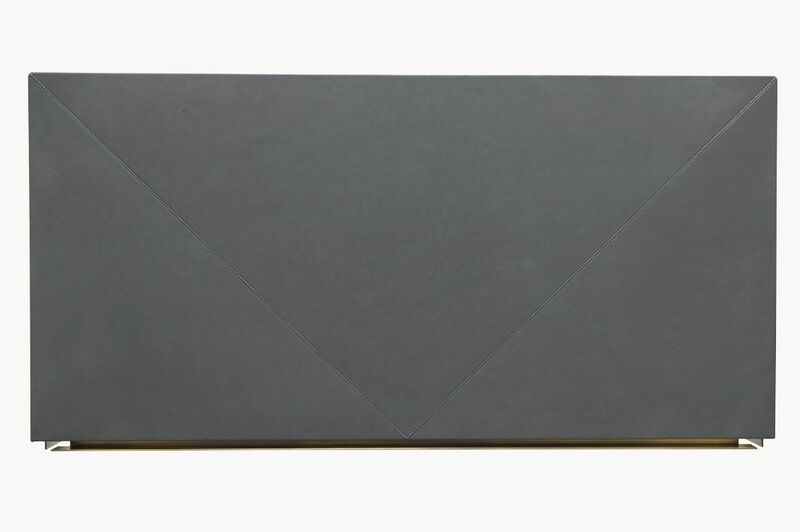 Our latest collection of new work debuted at Milan Design Week 2019 and included the CB-167 Cross Leather Desk, part of a new series of tables consisting of elongated cruciform elements of solid brass.